Hosh was waiting for his cooking lesson next evening. “Ma," he said. "Can we fry the cumin seeds again today, and this time I'll do it while you watch." "Sure," said Isha. "In fact, you can cook a whole dish tonight to go with yoghurt. It is really quite simple and quick to make." "It's called Aalu Jeera. 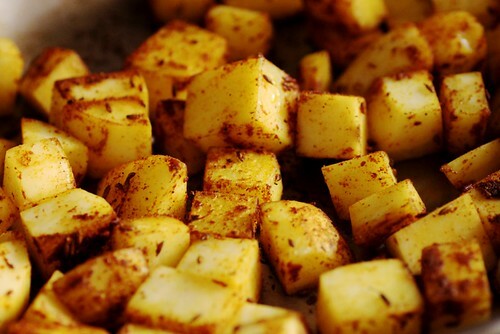 Just fried boiled potatoes and natural cumin seeds, but it's delicious and healthy." "But Ma," Hosh asked. "I'm going to forget the ingredients needed in a few days. I don't think I've learnt enough about the spices yet to start cooking whole dishes. Do you really think I'm ready to cook?" "You bet," she beamed at him. "You're as ready as you'll ever be, and you won't forget the ingredients as I'll make a list of them for you." "Remember though, that Ingredient Lists and Recipes are just a guide for starters. You'll learn to improvise with Indian cooking as you grow more confident." It didn't take them long to organize the ingredients as everything was in the pantry. Together, they washed and chopped potatoes into small cubes. They heated oil in a fry pan and then added the cumin (mustard) seeds, fenugreek seeds and asafoetida. Hosh fried these with the lid on while the spluttering continued, and added potatoes when it stopped. Isha asked him to stir with the pan uncovered now. They added turmeric, cumin and coriander powders, green chili paste and salt. Hosh felt quite proud that Isha thought he was ready to cook already, and stirred occasionally while chatting with her. Isha told him that this was a dry curry, so she asked him to leave the lid off 10 minutes before the potatoes cooked. "Different people can make Aloo Jeera differently," she said. "You can watch other versions of making Alu Jira on YouTube at your leisure." "But how do you know when they are cooked?" asked Hosh. "And how will you know they'll come out tasting good?" "Try squashing them to the side or bottom of the pan," she answered, " with the stirrer or knife. If it goes through them as easily as a hot knife would go through butter, then they are done. You could also try squeezing them between your fingers the first few times, when you think they are cooked but be careful, as they might be very hot to touch." "As for taste, there is no better test than putting one in your mouth and tasting it. If it's not salty enough, add a bit more salt. Too much salt is not good for anyone though." He cooked them uncovered and tested and tasted them as she had asked him to. Then she garnished them with chopped fresh coriander before serving. It was agreed that nobody would be told that Hosh had prepared Aalu Jira tonight, until after everyone had dined. Alu Jeera got its usual applauds at dinner. Nobody thought anything of the secret smiles mother and son had exchanged at the table tonight.